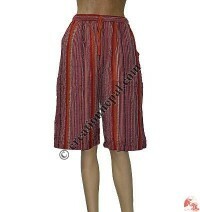 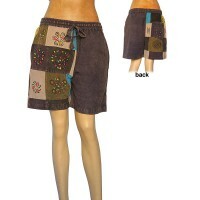 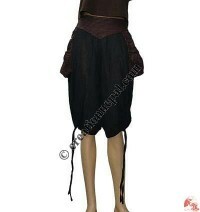 Creation Nepal offers some design of cotton ladies shorts as a part of Nepalese ladies clothing products. 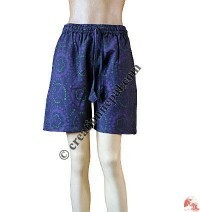 We have Nepal cotton ladies shorts decorated with different patch work, cotton tie dye shorts that are all handmade in Nepal produced in fair trade norms. 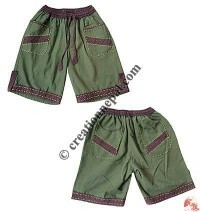 Creation Nepal, the manufacturers and wholesale exporters of Nepal women clothing online store offers pants or shorts for women regularly from Kathmandu. 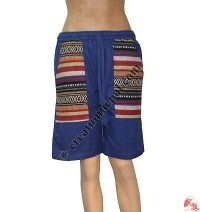 We offer handmade ladies shorts, ladies three quarter shorts and ladies shorts decorated with hand embroidered, tie dye cotton Nepalese shorts for women, plain cotton ladies shorts in various colors. 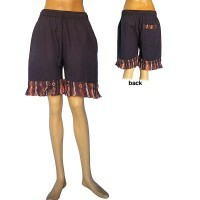 Nepalese Double shyama unique shorts, stripes deco pockets shorts, gheri pockets shorts, khaddar shorts, fine rib cotton ladies beach wear, cotton stripes big side-pocket shorts, fine rib ladies shorts, shyama ladies shorts, flower Prints shorts, tie-dye design shorts are available online.